The brand new Audi Design Studio is huge. Measuring a cool 107 by 70 metres it is part of a vast manufacturing plant in Ingolstadt, Bavaria. As you’d expect from German meticulousness, it is also immaculate, with clean concrete lines complimented by solid oak and cotton flourishes. This minimalist creative space must be a dream come true for the 600 staff working on new Audi models, with 6 floors, breakout areas and coffee points on all levels. The innovative double glass façade means workers can see out, but prying eyes can’t see in. And, with three sectors inside the structure, there are spaces for any kind of requirement, from initial concepts, through to modelling and even an outdoor space on the top level that allows for new model unveils. It was put to good use on Thursday when Audi took the covers of its brand new A7 Sportback model. Earlier in the day, however, Audi staff allowed journalists to get a fascinating glimpse into the journey from concept to creation. And, it’s a lot more organic than you might think. This elegant four-door couple began its life as nothing more than a drawing on paper, which is something you see a lot of as you pass through the numerous evolutionary stages of creating a new car here. Technology has, of course, transformed the way cars are designed and manufactured, but the creative human element is still an essential part of the process. Initial designs are worked up using CAD methods, with new improvements in the rendering process allowing for much more realistic scenarios that the new model will feature in. Audi designers showed how they can drop the mock-up into any environment, and change the colour or viewing angle to see what lines do and don’t work. It’s fast and efficient, but still a painstaking task. With the initial design concept signed off it’s on to clay modelling. While a lot of this is done with CAD and robots nowadays, there is still a small army of workers who craft the finishing curves of the new car. For the A7 Sportback there were plenty of challenges, not least of which was the headlights, with no less than three different versions that kept an entire lighting design department occupied for many months. The interior of the A7 Sportback is another area where the team were able to blend design and technology in a new way. It’s a clean but sophisticated feel complimented by sumptuous Valcona leather, which contrasts beautifully with one of fifteen exterior paint options that includes eight brand new colours. Very cool optional ambient interior lighting adds to the appeal, while the central not to mention sizeable 10.1-inch upper display takes touchscreen technology to new levels with its impressive haptic and acoustic feedback controls. Audi has developed its new MMI touch response concept to go above and beyond what a driver needs on the go. For example, it’s possible to write your destination on the screen with a fingertip and the sat nav will find it. While, that upper screen allows you to control the infotainment system, there’s a similarly beefy 8.8-inch lower display below that for climate control, comfort functions and text input. Seeing how the designers take the initial interior idea and piece this technological jigsaw together is fascinating. Again, the process starts with drawings, then models and mock-ups before progressing to tangible components that are brought together to make the finished interior. By way of an example, the Audi designers show us a table full of hand drawn infotainment segments, such as navigation buttons, map displays and music track selections. These are all magnetised, allowing designers to stick them to an infotainment-sized board to work up a provisional screen layout. Seeing the contrast between that and the end product is pretty mind-blowing. The innovation gets even more impressive when we begin to drill down deeper into the components and technology that lies behind the dashboard. This is where the process involves not just designing and making tangible parts, but the operating systems behind the screens have to be coded, programmed and incorporated into the dashboard design too. There’s no better example of this than Audi’s AI button, which offers another dimension in functionality and driver assistance. Soon there’ll be remote parking and the Audi AI remote garage pilot, which will be added to the specification during 2018. Apparently this will let the driver get out of the car and then launch the function via the myAudi app on their smartphone. On top of that there are 39 different driver assistance systems, depending on which of the three available packages you choose from. 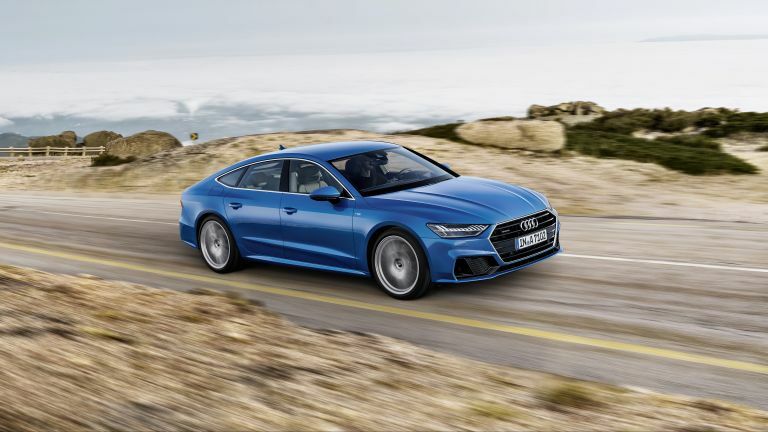 Add it all together and the Audi A7 Sportback is a stunning car that comes packed to the hilt with technological innovations. The body features a steel and aluminium composite construction, while the panoramic glass sunroof gives the interior an extra feel of light and space. Engine-wise, the car will initially launch with a 3.0 V6 TFSI unit, paired with a seven speed S tronic transmission that delivers 0 to 100 km/h in 5.3 seconds and boasts a top speed of 250 km/h (155.3 mph). Additional six and four-cylinder engines, both petrol and diesel, will follow shortly after the start of production.